In Doric Hall on the second floor of the current Massachusetts statehouse, you will find this bronze bust by Leonard Volk. 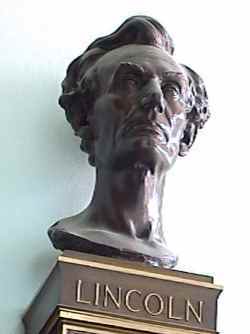 Lincoln sat for the sculptor in 1860, who used a life mask to make an accurate likeness of his then-beardless subject. The bust is centered over a bronze tablet containing the text of Lincoln's Gettysburg Address. The memorial was presented in March 1912 by the Women's Relief Corps, Department of Massachusetts.